Here is one of our 1996-7 AHU-1Z Diesel engines. Its shown here all done and ready for installation! We have over 100 hours in the engine restorations with cleaning all the parts, painting with hi-temp paint, polishing all the bright parts, but mostly installing all the new correct German parts. Above is the assembled engine. This is the T-belt side, the side that is on the passenger's side when installed. Here you can see the new Timing belt, new tensioner, new roller, new 3-way belt and on the right is the alternator. Here is the back of the engine, the side that faces the firewall. Here you can see the turbo, the exhaust manifold, the manifold heat shield, the intake manifold, the turbo downpipe, the EGR tube. These parts are difficult to easily see with the engine installed as they are facing the firewall. The front of the engine, the part that faces the front of the car and is easy to see everything on this part of the engine when its installed. Here is the injection pump, the new VW OEM Bosch Glow plug bridge hooked up to the new Bosch glow plugs, the new return fuel lines, the polished injector fuel lines installed with new seals, the new crank vent tube connected to the new crank vent regulating valve on top of the valve cover, (that would be the valve cover that was stripped and painted with 3 coats of hi-temp gloss black paint and installed with Conitech German gasket set including the three sealing rings for the attaching nuts) the new bio-fuel lines (Gates-USA) connected with new stainless clamps, the polished Bosch alternator, the polished AC compressor, the new oil cooler, the new 3-way coolant flange, and new oil dip stick funnel. New oil cooler attached to the engine. New oil cooler before installation. 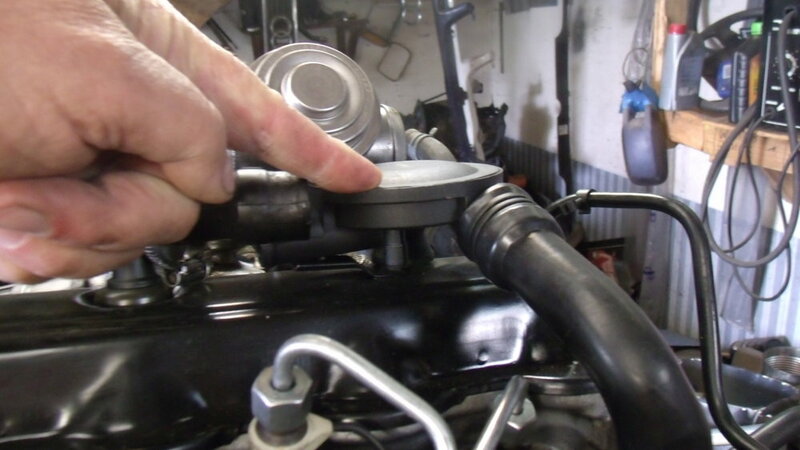 New Bosch glow Plug bridge connected to the new Bosch glow Plugs. 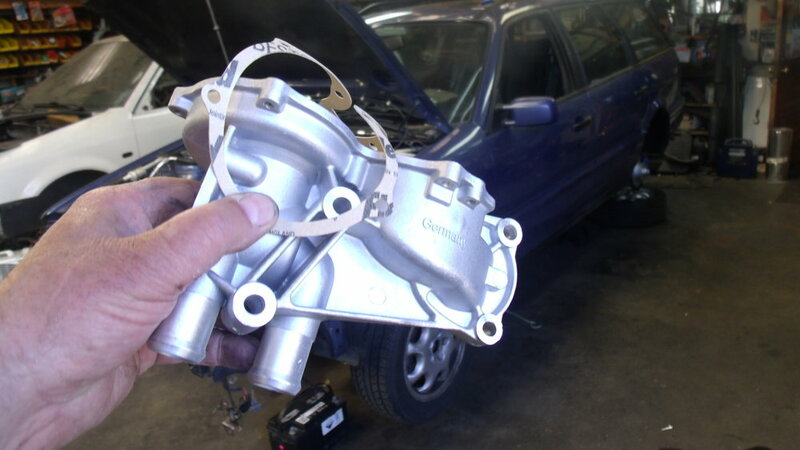 New German water pump with steel impellers. AC compressor - VW OEM SV7V16. 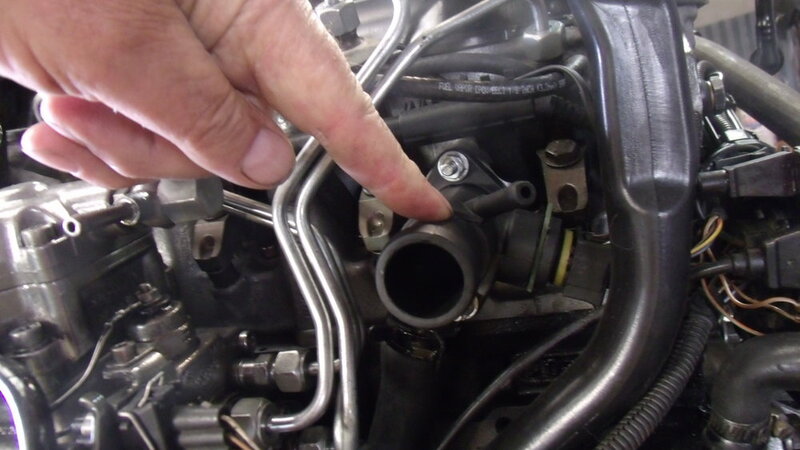 EGR tube that runs between the manifolds. 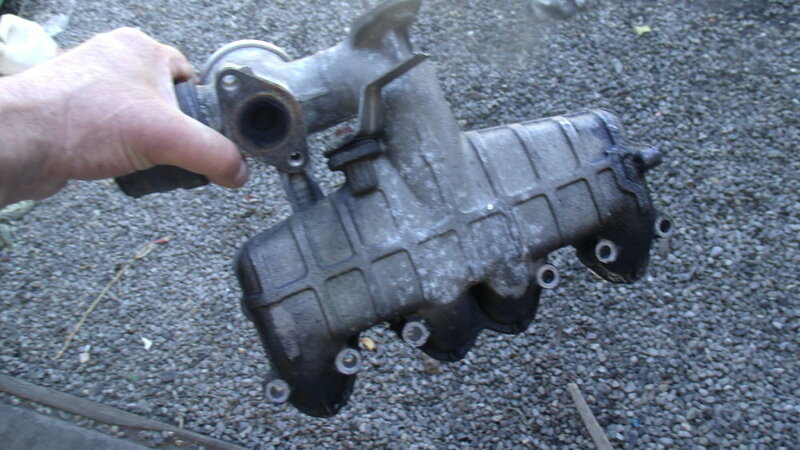 Intake manifold prior to cleaning. Engine mount after cleaning and polishing on a wire wheel. Dirty aluminum exhaust manifold heat shield. Aluminum exhaust manifold heat shield after cleaning and polishing. Exhaust manifold prior to painting with 3000 degree high temp black manifold paint. New crank case regulating valve. 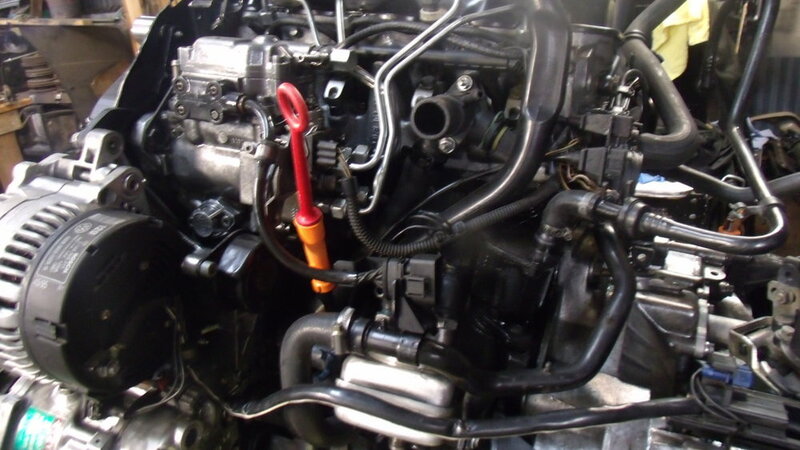 New return fuel lines between the injectors.